Hollybeary Creations : Newton's Nook Designs April Release!! Newton's Nook Designs April Release!! Happy Monday everyone.. are you ready for a week of sneaks into the April Release from Newton's Nook? Today we are introducing... Newton's Graduation and coordinating die. We also have a brand new stand-alone Essentials Alphabet Die set. I love this fun stamp set... 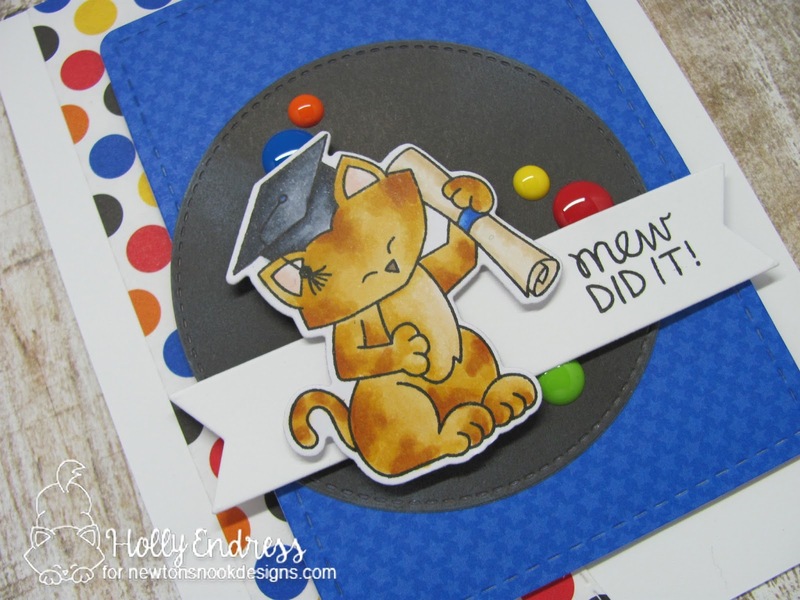 It's perfect for graduation cards for any age. I created a White card base and then I added some Fun Doodlebug pattern papers. I stamped Newton onto some X-Press it blending cardstock and colored him in with Copics. I used the coordinating dies to cut him out. I used the Land borders and the Frames and Flags Banner die sets to die cut my pattern papers and banner. On the Black circle, I added some White ink to create a chalkboard effect but keep it subtle. 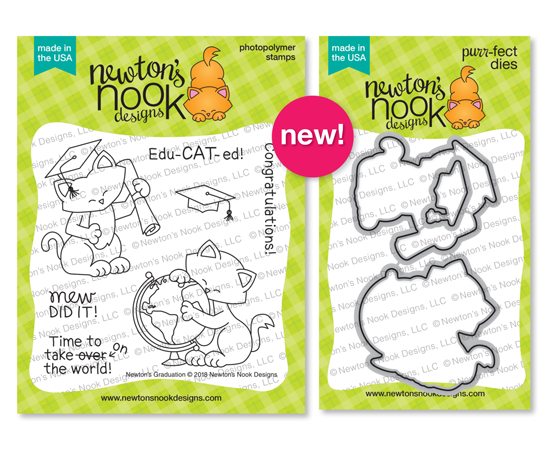 Would you like to win the “Newton’s Graduation” Stamp Set? Love the primary colors you choose and love Newton as an orange tabby! So fun! I love the bright colors you used! brightness of color & cute design. Such a cute and colorful card. Love the clever sentiment. Your coloring on Newton is lovely. Great card! Just darling with the nice primary colors! Cute choice of background papers! This is really amazing! What a wonderful card. What a colorful card! I love it! Newton is always so adorable and cute! Love so much your beautiful card!!! CUTE! 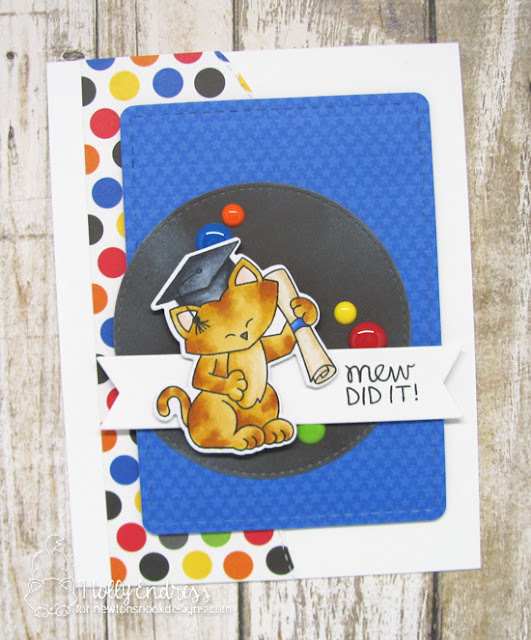 Love what you did with the new graduation set and bright polka dots! Just adorable. Made me smile. These sentiments and darling and I think perfect for any age group!!! Love your cute creations!! Such a fun card! I love the colours! So bright and colourful! I love it!! Your card is adorable ! I love the blue of your background paper, it's really beautiful and make your Newton really pop-up. Cute. I like the fun papers you used. Great colourful background for your cute little Newton. I love your card design on this one; so pretty!! That's the perfect paper to use with this Newton! I love the primary color palette and the Nuvo drops? enamel dots? that you put around him. And, of course, your coloring of Newton is spot-on. Thanks so much for sharing! I love the brightly colored Newton. Great for the graduate. Good Job! I absolutely love your coloring of Newton! Wish I could capture the realistic patches of color that well!! This is such an awesome, vibrant card! The dots are a great accent with the paper and the enamel dots! love your color combo! beautiful card!